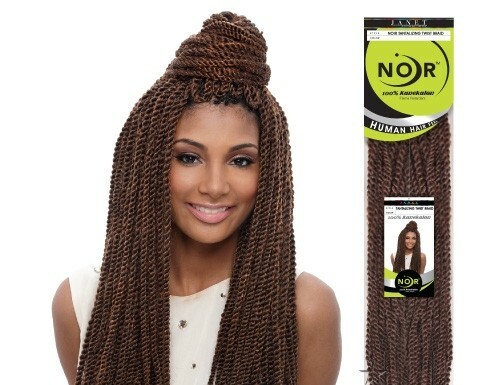 Using pre-twisted hair you can achieve crochet Senegalese Twists in three hours or less. Here are tips for getting the best results! Crochet braiding has been around since the 90’s, but the look has now evolved to include a wide array of style options with Senegalese Twists being one of them. Read the Guide to Installing & Caring for Crochet Braids. Don’t forget to moisturize your hair before you tuck it away! Crochet braids can be worn for a month or two which is why you want to make sure that you moisturize before you do this long term protective style. I ended up using Shea Moisture’s Grow & Restore Styling and Jamaican Black Castor Oil paying extra special attention to my ends. Your braid pattern doesn’t have to be complex (stick to what you know). For all of my crochet styles with the exception of my latest one, I have done simple straight back cornrows and my crochet braids looked fabulous. However, since this was the first time I was planning on doing Senegalese Twists I was thinking maybe I should do something different. I regret that decision. The pattern I chose seems to require that you sew your ends down, which I hate doing (for me sewing increases the odds I might cut my real hair by an accident). Or perhaps I could have just braided my ends more tightly? Who knows? All I know is I won’t be doing it that way again. I ended up purchasing 8 packs of hair and I only used 6. My twists are thick and are shown in the photo at the top. I used the Janet Collection Tantalizing Twists brand of hair. I thought it was better to go a little over than to go under than be in the middle of doing my hair and have to stop to get some more packs. The smaller the twists are the more packs are you are likely to need. You want the right balance, you don’t want the hair to be overly thin or thick. Before I made adjustments I felt like my hair was too thick. This was due to thickness of the pre-twisted hair I chose and the braiding pattern (that I was not use to working with). I ended up taking some sections out for more balance. Luckily if you make this mistake it’s easy to take to the twists out without damaging the hair, simply take the knot out and you are good to go. With thicker hair the less sections you will need, with thinner hair you will need more sections for coverage. Ultimately you do want your hair to be even, but if it’s too blunt it may not look natural. Make sure before you install you get the hair as even as you can. If it is slightly off that is okay because it help to give your hair a natural stagger. Install the twists as close to your edges as you can for a more natural look. Also the twists in the front should be closer together so they are hiding your cornrows. one major problem i have, seems to be the only person dealing with this but when i install my crochet twists, the ends stick me on my back and shoulders which is very irritating. is it something im doing wrong?